Place the Adafruit_HT1632 library folder your arduinosketchfolder/libraries/ folder. You'll also have to install the Adafruit GFX graphics core library at this github repo. Rename it to Adafruit_GFX and install it the same way as the Adafruit_HT1632 library. Now you are ready to test! Open up the IDE and load File→Examples→Adafruit_HT1632→basicdemo and upload it to your Arduino. 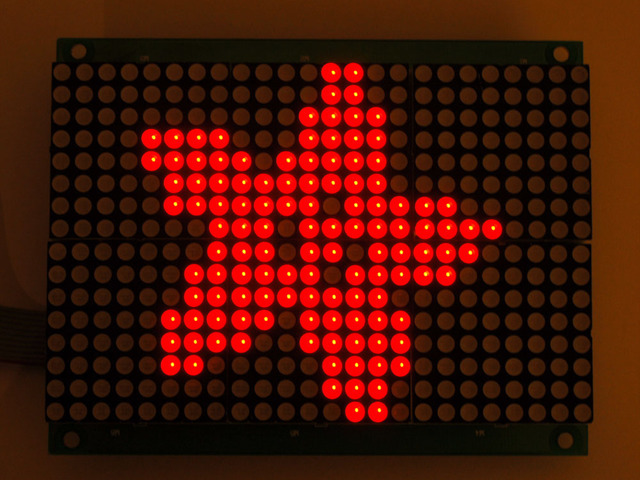 Once you have done the low level test, open up File→Examples→Adafruit_HT1632→matrixdemo - this is a more useful demo, it will light up all the LEDs in order on the panel. This guide was first published on Jul 31, 2013. It was last updated on Jul 31, 2013. This page (Testing) was last updated on Apr 21, 2019.